Potting mix is an essential product which you need when planting. Although garden soil already contains nutrients, your plants need more. This is especially true if you're planning to grow your plants in pots or other types of containers. Out of all the potting mix products out there, one of them stands out - the Sta-Green Potting Mix. This first-class potting mix comes in a lightweight and convenient size. This makes it easy to work with for when you need to perform gardening tasks. These include transplanting, potting, or planting with indoor or outdoor plants. The potting mix has a "Moisture Max" feature. This will help your plants meet their moisture requirements. The Sta-Green Potting Mix is rich, porous, and drains well. Now let's learn more about this great product! The Sta-Green Potting Mix is specifically formulated for all types of container gardening projects. You can use it for planting in patio planters, window boxes, and even in raised-bed gardening. It's also suitable for all types of indoor and outdoor plants. These include vegetables, herbs, flowers, and more. It's so versatile that you can even use it when you're planting trees and shrubs! One great thing about this potting mix is that you can also use it for transplanting. Then your plants will quickly adapt to the porous, well-drained, and rich potting mix. 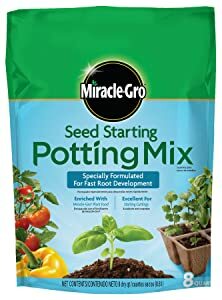 This potting mix even has a patented fertilizer that releases slowly. This allows for constant feeding for as much as 9 months. 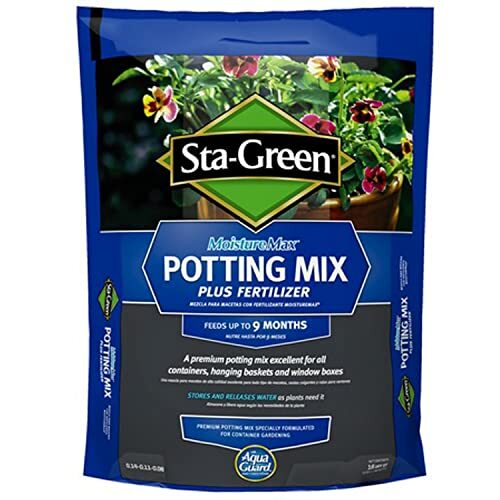 What are the advantages of using Sta-Green Potting Mix for growing plants? Potting mix products such as the Sta-Green Potting Mix will be very beneficial for your plants. This product contains a unique and patented water-absorbency polymer. It can store and release water according to the moisture requirements of your plants. The premium product is suitable for different plants, either indoors or outdoors. Before you purchase any kind of product, you would like to know how they will benefit you. Therefore, let's go into the different advantages of this particular potting mix. From the components to the texture, there's really a lot to look forward to. Any great potting mix needs to contain organic material that's rotted. The formulation of Sta-Green Potting Mix varies from one region to another. But it usually contains a significant amount of decaying plant matter. One important component of this product is rice hulls. This component is responsible for effectively retaining the water. Aside from compost, the potting mix also contains other healthy components. First, it contains potassium nitrate. This activates the essential enzymes and also helps stimulate the growth of roots. It also contains ammonium phosphate which helps leaves grow and shoots sprout. It also helps the plants produce more fruit. The urea component is a good nitrogen source. The reed-sedge peat is a type of decayed plant material. This also retains water as well as nutrients to help the plants grow. It also contains Canadian sphagnum peat moss. This component aerates the compact soil and acts as a conditioner. The ground dolomitic limestone buffers the soil's pH level while providing calcium. Finally, the potassium sulfate will help the plants work better. They will function well even when there isn't enough water. These are the main components of the potting mix and they all have excellent benefits. Finally, the Sta-Green Potting Mix also has a good texture. It doesn't clump together and it's not too heavy either. It has superior drainage capability to, which is another big plus. How do you use Sta-Green Potting Mixture? For non-professional gardeners, the idea of planting seeds in the garden is intimidating. This is mainly because you need to consider so many things before you can start. One of the most important things to think about is the soil in your garden. If it doesn't contain enough nutrients, your plants won't be able to grow and thrive in outdoors. The first thing you need to do is find the perfect spot to plant your seedlings. Adding potting mix to the soil where you're planning to grow seedlings is a great way to start. Fortunately, using such products is very easy. That is as long as you've decided where to start planting. After you've graded the soil, you can place the seeds. After planting the seeds, make sure to water the potting mix properly. Do this so there's no risk of losing your plants or of them not growing into saplings. 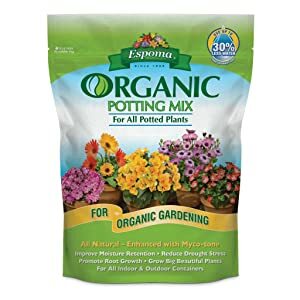 This organic potting mix contains only the best, all-natural ingredients. It doesn't contain any type of artificial chemicals or plant foods. You can use this mix for all types of outdoor and indoor potted plants. This mix has a unique Myco-Tone formula which helps save water. It even comes in a clever, easy-to-open, weatherproof bag that's resealable. Organic product which contains rich and all-natural ingredients. Doesn't contain any artificial chemicals or plant foods. Suitable for all types of outdoor and indoor potted plants. This potting mix is great too because it will feed your plant for up to half a year. You can start your seasons off the right way using a batch of this fresh potting mix. Use it on your indoor plants to replenish the nutrients and avoid the compaction of the soil. 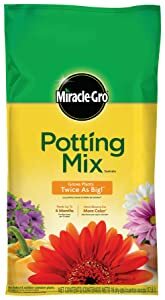 If you want to keep your plants healthy, it's best to re-pot them annually using this potting mix. Helps make your plants grow twice as big. Also, will help the plants yield more color and more blooms. Will keep the plants fed for up to half a year. Finally, here's another product from the Miracle-Gro brand. But this time, it's specially formulated for the fast development of plant roots. The enriched potting mix is perfect for when you're starting cuttings. This product comes in an 8-quart size which makes it ideal for small projects that you do indoors. A lightweight potting mix that's ideal for germinating seeds. Has a special formulation which will promote the fast development of roots. There are some excellent alternatives out there. But the Sta-Green Potting Mix remains to be the best. The premium potting mix is ideal for all your outdoor or indoor gardening projects. It contains the patented Moisture Max feature. This is a special polymer that absorbs water. Then it releases the water to meet the needs of your plants. This mix is the ideal media for growing different types of plants. It will even provide continuous feeding for your plants from the slow-release fertilizer. With the potting mix, your plants will surely grow, thrive, and yield as well. All these benefits come from its high-quality ingredients as well as the proper usage.